The deep end: Do the Union finally have depth to compete? You could almost set your clock by it for the past three years. Right around the 70th minute, Jim Curtin subs a winger on. Five minutes later, a poacher enters at striker. Finally, a defensive midfielder comes on to see the game out. The substitutes were neither surprising nor impactful, and Jim Curtin knew it. “We ask them a lot of times to bring a knife to a gunfight, and they don’t complain,” he said at the end of 2017. It wasn’t just that the subs weren’t contributing, but when injuries struck, those depth pieces couldn’t steer the team full-time either. Sometimes there were diamonds in the rough (hey, Jack Elliott! ), but more often then not the Union’s form took a nose dive. If you take away Roland Alberg’s seven goals, the only other bench player to get on the scoresheet in 2017 was Marcus Epps’ two goals in MLS play. Since the team’s inception, it’s often been quality depth that has kept the Union below the playoff red line. In 2017, Greg Vanney claimed that Toronto FC was “the deepest team in MLS history.” They went on to set the record for most points in a season, winning the Supporter’s Shield, Canadian Championship, and MLS Cup. He may have had a point. As Kevin Kinkead noted in PhillyVoice back in 2016, Toronto built their depth through three types of players: 1) a few superstars; 2) grizzled MLS veterans; and 3) Homegrown signings. While Philadelphia will never pony up the cash for a Sebastian Giovinco or Jozy Altidore, the team is following Toronto’s blueprint for success. 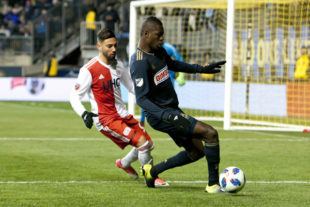 One game is no sample size, but the Union’s roster is already far deeper than anything Jim Curtin has had at his disposal – despite the fact that the Union brought in just two players from outside the organization. With national team stalwarts like Alejandro Bedoya, Andre Blake, and Haris Medunjanin already on the roster, the Union added proven MLS star David Accam and hopeful No. 10-heir Bořek Dočkal. These two simple moves to upgrade the starting XI – and bringing three homegrown players to the first-team – just made the Union bench a whole lot deeper. The midfield is particularly stacked and finally gives Jim Curtin some flexibility with game-changing substitutions. Need a speedy hold-up winger? Corey Burke. Want more possession? Anthony Fontana. Would like to give Haris Medunjanin some support? Derrick Jones. And you still have Fabian Herbers, Eric Ayuk, and Ilsinho – former starters with totally different playing styles – standing by. On defense, starting-caliber backs Richie Marquez and Ray Gaddis are ready to fill in too. The Union have further followed Toronto’s blueprint with proven MLS veterans like C.J. Sapong and Fabinho. The rest of the roster is filled in by young draft picks and Academy players. Greg Vanney won accolades last year for his ability to switch schemes and formations depending on the opponent, culminating with Toronto jumping into a 4-4-2 diamond (away from their typical 3-5-2) in a dominating MLS Cup victory over Seattle Sounders. While Jim Curtin will likely never make such large tactical swaps, the team’s depth in 2018 certainly allows for some creativity and matchup-planning from the manager. His success and reputation this year will likely depend on whether Curtin can finally out-coach opponents now that he has the resources at his disposal. Philadelphia is still a far cry from Toronto’s level of talent, but 2018 may mark a turning point for the franchise with a bench finally deep enough to make a significant impact over the grueling MLS season. I believe, “the farm is starting to bear fruit” could have been the title for this article. Some depth? Yes. Compete? Probably not. Yes, we have the depth to compete for a title. No, we do not have the high end talent to compete for a title. This is 100% true. On those lines, the union will be doing the dirty work in mls for us soccer. I’m ok with that. If/when they become contenders, I think it will be a sign that us soccer is on its way. I am not going to be a sugarman hater. I see what he’s doing and I’m ok with it. We’ll all be ok with it when our guys are starting for the national team. Nor do we have a coach who can optimally utilize that talent. It could be the best team we’d ever had… on paper of course. I still don’t think Curtin can pull the right strings, but feel free to prove me wrong, Jim. Gotta see this team play another half a dozen games with Dockal out there before we can make a prediction. Though in this league, predictions aren’t worth a whole lot. Can’t believe we have to wait another 9 days for this team to play again. Yup. As excited as I am to see more (and to get this youth thing started), I’m also realistic, and know the Union have a long way to go. I want to see more and have more data points, before any proclamation that the Union have arrived for contention. Well, at least the weather will be nicer later on? It was definitely nasty out there for the opener. I do hope more people show for the next game. I believe in the farm system. But I’m not sure that Curtin is the right guy to use it wisely. We have plenty of depth on the wing, it seems. The one game certainly suggested that Fontana will make a fine understudy while he continues his development. Plus there’s Najem. So assuming Dockal works out at least decently, we have depth at CAM, amazingly enough. With D. Jones and Creavalle, we have depth at CDM. Marquez and Gaddis are certainly good backups at CB and RB. And McCarthy is a capable backup keeper. LB may be a problem. I don’t know enough about Matt Real to assess how well he would step into Fabi’s role if needed. And it will be needed at some point, because Fabi will get hurt or get suspended at some point. So that is certainly a potential depth problem. But the much bigger potential depth problem is at striker. We have yet to see anything to suggest that Jay Simpson can do Sapong’s job. And Cory Burke looked really excellent last week, but being speedy winger and being lone striker are very, very different roles. It is not clear to me whether Burke can do that job. And if he can’t, that is the potential chink in our armor this season. Because CJ just can’t take last season’s pounding every season. Dude’s gonna give out sooner or later. And when he does, he’s such a linchpin that I’m worried it could sink the whole team. Real did a good job in the last preseason game. Fairly solid defensively, and getting into the offense. If we didn’t already have such a young backline, I’d want to see him out there testing his mettle instead of Fabi. So we’ve copied 66% of their blueprint for winning and we think that’s enough? Swapping “superstars” for “stalwarts”? Isn’t that what all the also-rans do? See the Union making and winning first round of playoffs this year. Moving in the right direction for the first time in years. Should be a fun watchable season barring any major key player injuries. BET ON THE HUNGRY ACADEMY KIDS HELPED BY A CORE OF VETERANS, YOU WILL BE LOOKING AT PLAYOFFS.